Dr. Daniel Pauly is a French and Canadian citizen who completed his high school and university studies in Germany; his doctorate (1979) and habilitation (1985) are in Fisheries Biology, from the University of Kiel. After many years at the International Center for Living Aquatic Resources Management (ICLARM), in Manila, Philippines, Daniel Pauly became in 1994 Professor at the Fisheries Centre of the University of British Columbia, Vancouver, Canada, of which he was the Director for 5 years (Nov. ’03-Oct. ’08). Since 1999, he is also Principal Investigator of the Sea Around Us Project (see www.seaaroundus.org), funded for 15 years by the Pew Charitable Trusts, Philadelphia (currently by a number of foundations), and devoted to studying, documenting and promoting policies to mitigate the impact of fisheries on the world’s marine ecosystems (see AMBIO, 34: 290-295, 2007). Daniel Pauly has supervised a large number of Master and PhD students in the Philippines, Germany, and British Columbia. Details on the projects of his current students can be obtained here. 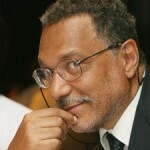 The concepts, methods and software which Daniel Pauly (co-)developed, documented in over 1000 scientific and general-interest publications, are used throughout the world, not least as a result of his teaching a multitude of courses, and supervising students in four languages on five continents. This applies especially to the Ecopath modeling approach and software (http://sirs.agrocampus-ouest.fr/EcoBase/) and FishBase, the online encyclopedia of fishes (www.fishbase.org), the latter recently complemented by SeaLifeBase (www.sealifebase.org). This work is recognized in various profiles, notably Science (Apr. ’02); Nature (Jan. ’03); New York Times (Jan. ’03), in developing countries, and by numerous awards, among them honorary doctorates from four universities, being elected a Fellow of the Royal Society of Canada (Academy of Science; ‘03); and receiving the Award of Excellence of the American Fisheries Society (‘04); the International Cosmos Prize, Japan (‘05), the Volvo Environmental Prize, Sweden (‘06), the Excellence in Ecology Prize, Germany (‘07), the Ramon Margalef Prize in Ecology, Spain (‘08), the Albert Ier Grand Medal in the Science category (’16) among others. Daniel was also knighted as Chevalier de la Légion D’Honneur (’17) by the French government on Bastille Day. Dr. Pauly has authored or co-authored over 1000 scientific articles, book chapters and shorter contributions, and authored, or (co-)edited about 30 books and reports. Pauly, D. and D. Zeller. (Editors). 2016. Global Atlas of Marine Fisheries: A critical appraisal of catches and ecosystem impacts. Island Press, Washington D.C., 486 p.
Pauly, D. and D. Zeller. 2016. Catch reconstructions reveal that global marine fisheries catches are higher than reported and declining. Nature Communications, doi: 10.1038/ncomms10244, 9 p.
Pauly, D. 2010. Five Easy Pieces: How Fishing Impacts Marine Ecosystems. Island Press, Washington, D.C., xii + 193 p.
Pauly, D. 2010. Gasping Fish and Panting Squids: Oxygen, Temperature and the Growth of Water-Breathing Animals. Excellence in Ecology (22), International Ecology Institute, Oldendorf/Luhe, Germany, xxviii + 216 p.